Even though I pretty much consider myself an Italian girl, I am in fact, part German, among other things. (This may or may not explain my love of beer and meat.) Since September is Oktoberfest, I could not let it pass by without sharing a recipe that celebrates my German heritage. 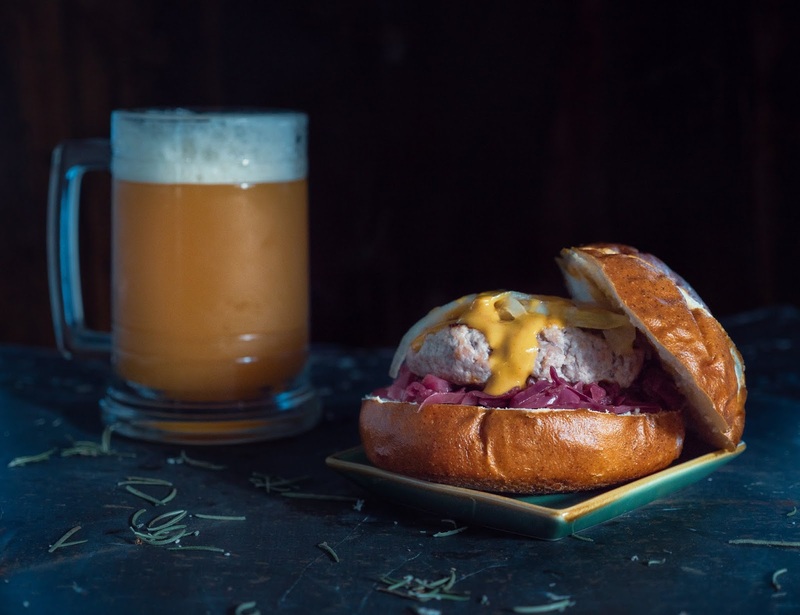 Served on a pretzel bun, these pork burgers are seasoned just like bratwurst and topped with tangy German red cabbage (rotkohl), sauteed onions, and a sweet beer mustard sauce. This one recipe combines all of my favorite Oktoberfest food flavors into a burger form that, of course, pairs well with beer. There are a lot of steps for this dish but don't let that deter you. They aren't hard and they are well worth it. While I like sauerkraut, a traditional brat topping, I wanted to bring in one of my favorite things - Rotkohl aka German red cabbage. It's basically red cabbage that is slowly cooked down with onion and apple in a vinegar spice combination. Ever since I was little I've loved it. It's a strange thing for an American kid to like, but it's just proof that I've always been a foodie. Then I thought instead of putting the red cabbage on a regular brat, what if I turn the brat into a burger. I found some lean ground pork that I seasoned with brat spices like sage, rosemary, paprika, mustard, and coriander. The spice combinations in bratwurst vary depending on the region. In fact, in Germany, there are something like 40 different varieties of bratwurst. With the tangy and meaty flavors covered, I wanted to balance things out with a little sweetness from onions sauteed in butter, another traditional bratwurst topping. To cap it all off I whipped up a sauce to pour over everything. To some of the Tiger Tail yellow mustard from this month's Degusta Box, I added paprika, honey, and, of course, beer. I went with a dark wheat beer, but I think an Oktoberfest, porter, or even a stout would work well. And, I'm sure you could also use an IPA. And, what better way to serve it all than on a pretzel bun! I am not much of bread maker so I did rely on my local grocer for the buns. Someday I swear I'll attempt to make own, but until then I'll use the help where I can get it. Melt 2 tablespoons of butter in a Dutch oven over medium-high heat. Add the onion and saute until translucent. Toss in the shredded apple and red cabbage. In a small bowl whisk together the apple cider vinegar, water, and sugar. Pour over the cabbage mixture in the pot. Add the cloves and bay leaf. Stir to combine. Place the lid on the pot, reduce heat to medium-low, and cook about one hour. Stir occasionally. Melt 1 tablespoon of butter in a small saute pan over medium heat. Add the thinly sliced onions and saute until soft or slightly caramelized. Set aside. In a large bowl combine the ground pork, sage, paprika, cayenne, dry mustard, coriander, rosemary, and salt. Form into 4 burgers. While the burgers cook, in a small bowl whisk together the yellow mustard, paprika, honey, and beer. Set aside. 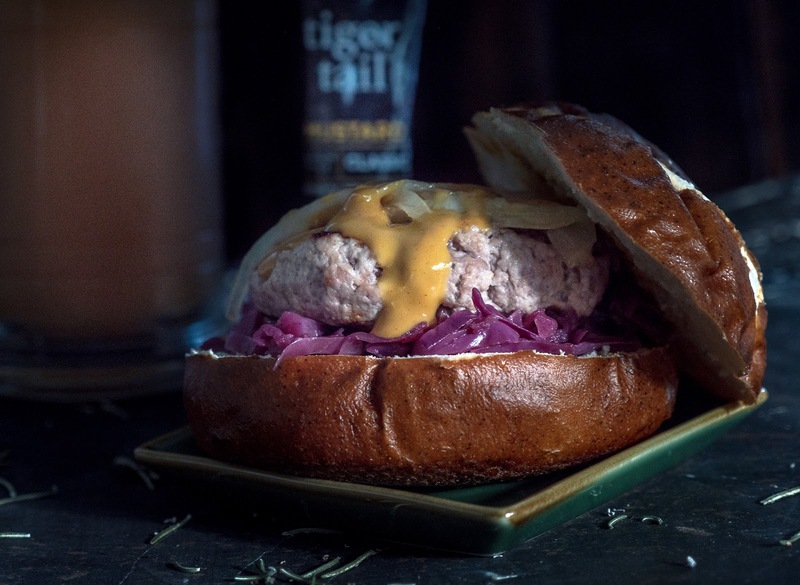 On the bottom half of each pretzel roll add some red cabbage, then place on a burger and some of the sauteed onions. Pour some sweet beer mustard sauce over the top. Add the bun top and enjoy!